Last month the USDA released the first major update to their "Plant Hardiness Zone Map" for the United States since 1990. Used as a plantings tool primarily by horticulturalists and gardeners, the revised map has moved New York into a warmer zone. Apparently, milder temperatures has changed the options for plant selection in our state. Does this also mean that we will be seeing earlier blooming of Spring plants? We already know that migratory birds have changed their schedule. Anyway, here are a few signs of Spring that I've noticed over the past week. Songbirds have begun their Spring courtships and many males can now be heard singing. Cardinals, Red-winged Blackbirds, Song Sparrows, overwintering Fox Sparrows and White-throated Sparrows, as well as, our resident House Finches, are some of the early amorous avian species practicing their sweet-sounding repertoires. Male Mourning Doves can be heard summonsing females to a nest site with their haunting "coo-OO-oo" call. Some are already sitting on eggs. I've already posted about Flowering Quince, snowdrops, Winter Aconite and hellebore, now there are even more blooms brightening the landscape. 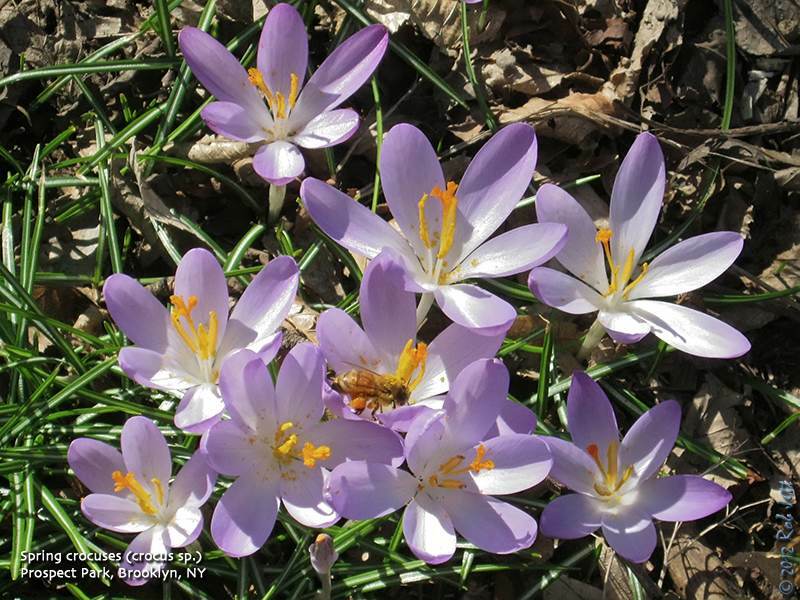 Spring crocuses, the flower most people associate with the start of the vernal equinox, are emerging all over our city parks and gardens. Daffodils are also beginning to emerge, although I haven't seen any flowers as of yet. Notice the full pollen baskets on this busy Honey Bee. Witch hazel is another one of my favorite early flowering shrubs. I love the look of this plant's long, spindly, bright-yellow petals against the Winter's deep azure sky. After reading about the various species of hammamelis plants, I came away a bit confused. 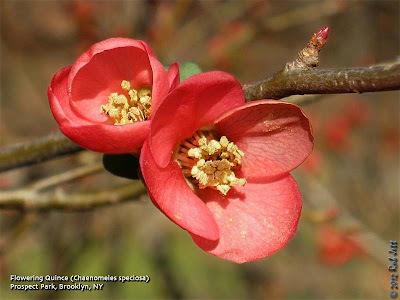 I've always assumed that the local species was "virginiana", however most reference material describe it as blooming in late-Fall. 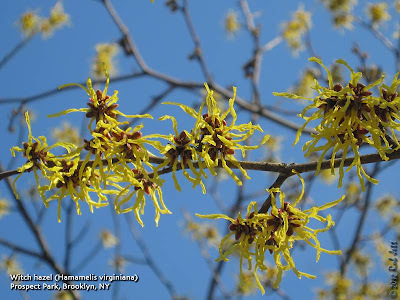 Another species, Hamamelis vernalis, is said to bloom from December to March. 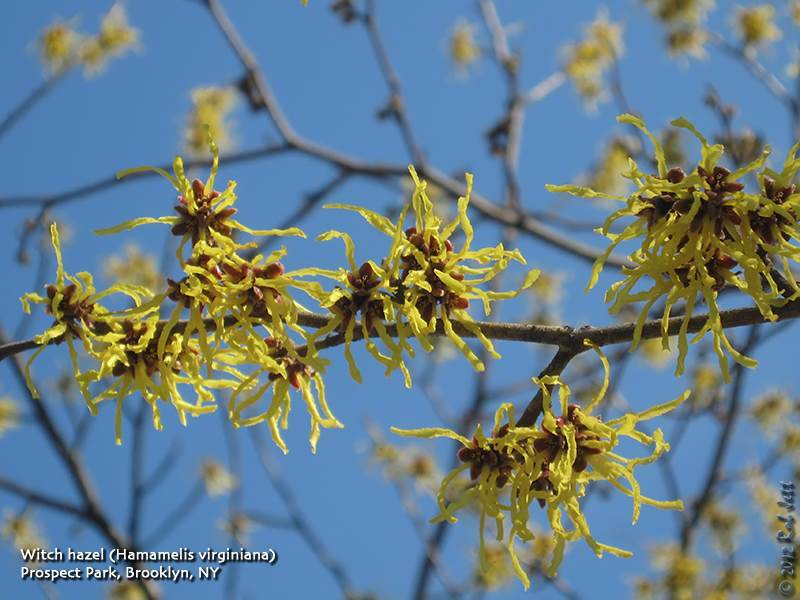 Unfortunately, Hamamelis vernalis or Ozark Witchhazel, is supposedly only found in the Ozark Plateau of Central North America. Maybe a reader with more knowledge of botanicals can post a comment here and help clear up this mystery. Using data compiled on the Cornell website eBird, researchers at the University of North Carolina at Chapel Hill find that rising temperatures are changing bird migration patterns. Birds in eastern North America are picking up the pace along their yearly migratory paths. The reason, according to University of North Carolina at Chapel Hill researchers, is rising temperatures due to climate change. The study results were published in the journal PLoS ONE on Wednesday (Feb. 22). Sunday, March 4, 2012, 10 a.m. Prospect Park "First Sunday walk"
Note: nearest train is "Q" train to Prospect Park Station and walk to the Lincoln Road park entrance. Registration opens Monday 2/20. Public transportation. Fort Tilden, Bldg. 1, 10:00 a.m. -- noon. Enter the woods with American Littoral Society naturalist Mickey Maxwell Cohen to search for early spring birds, bursting buds and historic fortifications of World War II. Saturday, March 3, 2012, 12 noon to 2:00 p.m.
Greetings. This is the New York Rare Bird Alert for Friday, February 24th, 2012 at 9:45pm. 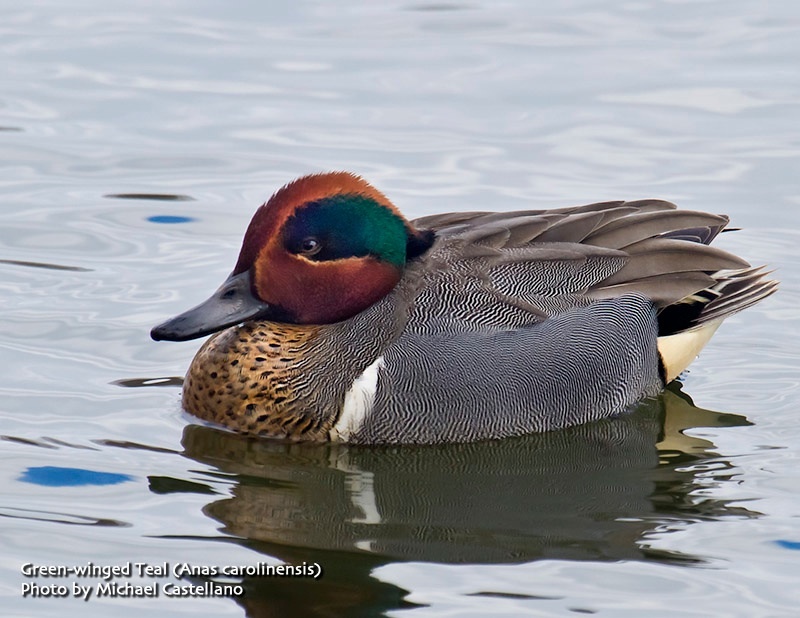 The highlights of this report are PINK-FOOTED GOOSE, EURASIAN WIGEON, BARROW'S GOLDENEYE, RUFOUS HUMMINGBIRD, NORTHERN SHRIKE, AUDUBON'S FORM OF YELLOW-RUMPED WARBLER, YELLOW-BREASTED CHATS, and LAPLAND LONGSPUR. On Tuesday a PINK-FOOTED GOOSE was found in Holtsville, Suffolk County, along the north service road of the Long Island Expressway, in a soccer field just west of Blue Point Road. The bird was with a flock of approximately 500 Canada Geese. The Pink-foot was relocated Wednesday in Medford, east of Holtsville, at the Medford Sports Complex on Horseblock Road, just west of Route 112. The bird has apparently not been seen since Wednesday. Reports from Floyd Bennett Field in Brooklyn last Saturday included a EURASIAN WIGEON and several RED-NECKED GREBES at the end of Archery Road (where both species were seen again on Monday and the wigeon again on Tuesday), the continuing but somewhat elusive NORTHERN SHRIKE near Field G, and a LAPLAND LONGSPUR in the Cricket Field. The drake BARROW'S GOLDENEYE continues to roost with Common Goldeneye on the West Pond of Jamaica Bay Wildlife Refuge. To see the Barrrow's you will need to arrive by 6:30am, as flyout is shortly after dawn. The best views are from the trail just past bench 7, and a scope is a necessity. In Manhattan, the RUFOUS HUMMINGBIRD continues through today at the West 81st Street entrance to the American Museum of Natural History. Look for it at the feeder to the right of the entrance. The Central Park RED-HEADED WOODPECKER was still present last Saturday near the Hallet Sanctuary in the southeast corner of the park. The Union Square YELLOW-BREASTED CHAT continues in the park's southwest corner off East 14th Street, at least through Wednesday. The Audubon's form of the YELLOW-RUMPED WARBLER was reported again on Tuesday at Sunken Meadow State Park along the south side of Sunken Meadow Creek, at the creek outlet. 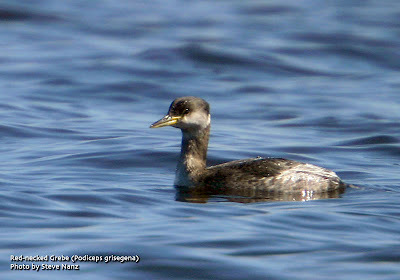 Further east, on Saturday a YELLOW-BREASTED CHAT was seen below the patio of the restaurant at Montauk State Park, and three RED-NECKED GREBES were spotted on Fort Pond Bay. Reports of an ICELAND GULL along Dune Road in the Tiana area on Sunday, Monday and Thursday are presumably the same bird. COMMON RAVENS continue to be seen during the week in the Water Tower area by the railroad tracks in Hampton Bays, Suffolk County. A pair of ravens has also been observed in the Co-Op City area of the Bronx, and may be the same birds seen from across Pelham Bay Park, in New Rochelle. RAZORBILLS reported last week were as follows: one at Montauk last Saturday, one at Pelham Bay Park in the Bronx on Sunday, five at Shinnecock on Sunday, and two at the Jones Inlet today. 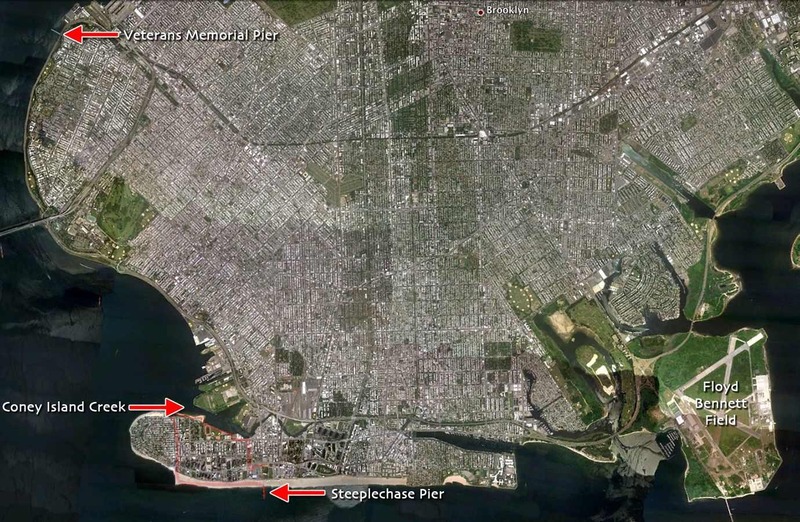 A PALM WARBLER was found at the Veterans Memorial Pier in Brooklyn on Monday. Instead of a phone chain that occasionally breaks down, and takes considerable time to transmit information, text alerts use simultaneous delivery of text messages. If a birder finds a rare bird on Long Island, they can send a text message from a cell phone to LIRBA, and that message is distributed to all LIRBA subscribers immediately (you will receive a text message on your phone). Furthermore, there is currently** no cost for the service beyond standard text messaging rates (the price you already pay for text messages from your cellular provider). Unless birders magically start finding uber-rarities at a higher than normal pace, LIRBA will likely be used sporadically and so won’t clog up your cell phone’s inbox. Birds reportable to BKBird should simply include any wild bird species that is unusual in either Brooklyn or Queens. The purpose of BKBird is to alert birders so that anyone interested in seeing a rare bird can obtain the information in a timely fashion. Since it is unlikely that most observers have a list of Brooklyn and Queens bird records memorized (although there will eventually be one on this site), good judgment is requested. 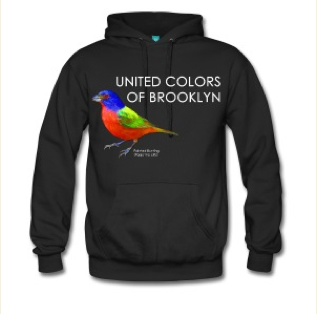 To learn more about "Brooklyn and Queens Rare Birds", click here. To learn more about "Long Island Rare Bird Alert", click here. I took the 3 train to the end of the line then walked 15 minutes south to Hendrix Creek. This narrow body of water at the outflow of a water treatment facility is usually a good spot for finding waterfowl and, occasionally, foul air. 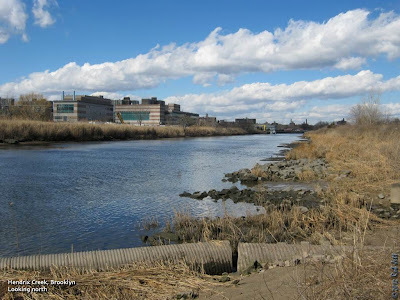 The creek runs from just short of Flatlands Avenue to Jamaica Bay. On an 1891 map of Brooklyn, it looks like it originally stretched as far north as the current New Lots Avenue. 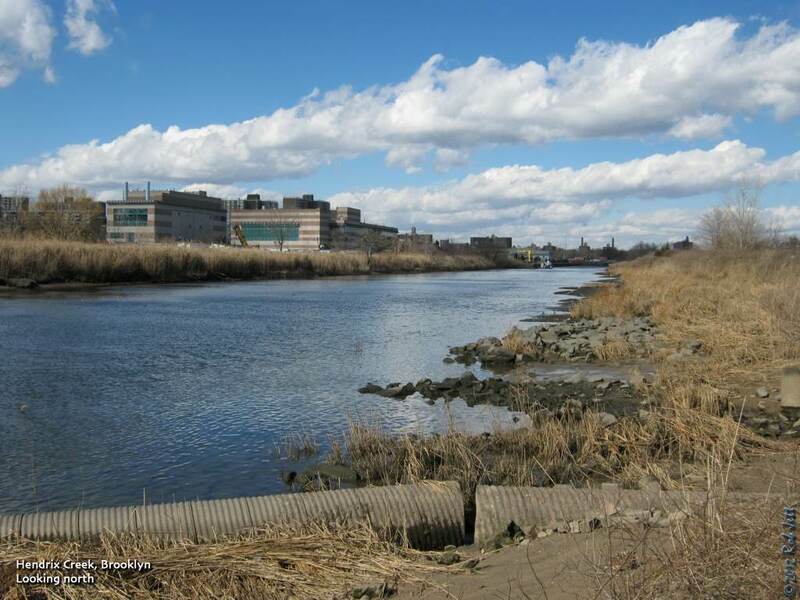 During a "normal" winter, when many of the boroughs lakes and ponds freeze, Hendrix Creek remains free of ice, most likely because of warm, clean water from the adjacent 26th Ward Water Pollution Control Plant. Because of the milder conditions here a great variety of waterfowl will over-winter in the area. It is not unusual to observer 12 or more species of ducks and geese. I was hoping to find some Green-winged Teal and, possibly, Canvasback. In addition, the horizon to the south is dominated by the mountainous Pennsylvania Avenue and Fountain Avenue landfills. Both are being converted to grassland habitat parkland. It is possible to see raptors hunting over the landfills. There weren't a lot of birds on the creek, but I did manage to find a small flock of teal hugging the east edge of the waterway. Before I saw them I could hear the male's distinctive short, whistled note. There were only a few dozen individuals present, whereas, on a more typical cold winter day one might count a couple of hundred birds. There were a fair number of Bufflehead on the creek, as well as, low numbers of Canada Goose, Gadwall, American Black Duck, Mallard, Ruddy Duck and American Coot. I walked to the south end of the waterway and under the highway to scan father out towards the bay. A Belted Kingfisher rattled from a perch on the opposite side of the creek. It seems like there is one in that spot every winter. Along the way I picked out the chittering call of a kinglet then spotted a ruby-crowned gleening insects from dried phragmite shafts. I decided to walk west across the Gateway Mall to Spring Creek, which is about 3/4 of a mile away. A western-most section of that body of water is within the borough of Brooklyn and I was hoping to find a new bird for the year there. As I walked I kept one eye on the landfill to my right. At one point I spotted a soaring Red-tailed Hawk and stopped to watch. A female Northern Harrier then appeared and began to chase after the larger raptor. 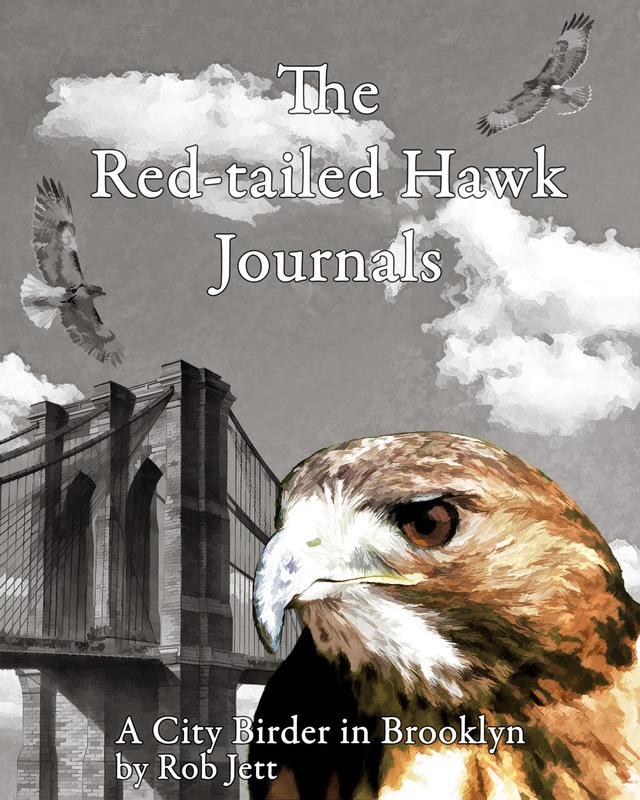 The red-tail just continued riding a thermal, circling higher and higher until the long-winged aggressor gave up and returned to the man-made mountain. Like my experience at Hendrix Creek, Spring Creek had very few seasonal species. I keep telling myself that this can't be the end of winter and that March should, well, come in like a lion and go out like a lamb. Some of my friends and family think that I'm crazy and should be glad that we've had a mild winter. I try to explain about how I miss the seasonal change because it means that I might not see some of my favorite birds this year. If this is the result of climate change, does that mean that eventually I may never see certain birds in winter? Meet in front of the Stranahan Statue at the northeast corner of Prospect Park's Grand Army Plaza entrance. $8. Pre-registration not necessary. If you have any questions, email me here. While the first day of Spring in New York City may still be 4 weeks away, the warm weather awoke this Clouded Sulphur butterfly. I actually found two of these small pierids chasing each other near Hendrix Creek in Brooklyn. 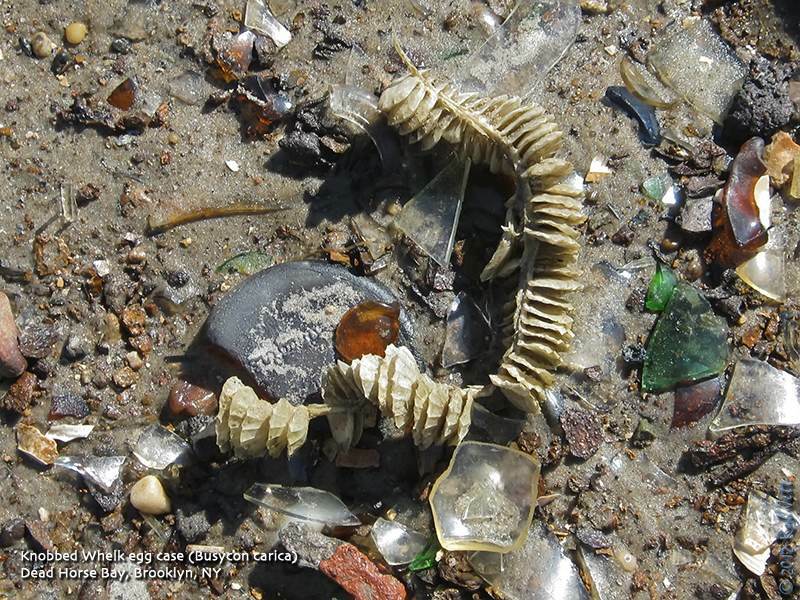 This past Saturday's trip that I lead for the Linnaean Society of New York to Floyd Bennett Field and Dead Horse Bay turned out better than I could have planned. While many of the expected over-wintering songbirds and raptors seemed to have vanished from the borough, I did manage to find for the group several special birds that thrilled everyone, including me. My plan for the day was to begin first thing at the boat ramp overlooking Jamaica Bay. A large parking lot here faces Ruffle Bar, with the western end of Jamaica Bay Wildlife Refuge out of view on the opposite side of the island. A rare BARROW'S GOLDENEYE has been seen periodically at the West Pond at the refuge, usually taking off to parts unknown early in the morning. The beautiful black and white bird has also been observed from Floyd Bennett Field by a few people in the bay off the western side of Ruffle Bar. Our group spent a long time scanning in the bay off of the boat ramp, but couldn't find the barrow's. There were lots of Brant, Canada Goose, Bufflehead, Red-breasted Merganser, Red-throated Loon, Horned Grebe and a scattering of Common Goldeneye. From the south end of the parking lot we could see a fair number of American Wigeon and Gadwall. We drove done to the Archery Road to get closer looks and, hopefully, relocate the EURASIAN WIGEON discovered the previous weekend. As it's name implies, the Eurasian Wigeon is not a North American breeding bird. This lovely waterfowl with the bright russet head winters from Iceland, the British Isles, northern Europe, southern Russia and Japan south to the eastern Atlantic islands, Africa, Arabia, India, the Malay Peninsula, southern China, Formosa and the Philippines. We are fortunate in New York in that every winter a few individuals stray down the northeastern coast. The water on the bay was glass calm making finding any birds fairly easy. There were about 50 American Wigeon near or around the bases of the old wooden pilings at this cove, but no eurasian. Both Great Cormorant and Double-crested Cormorants rested at the tops of the black, wooden columns making for a nice comparison of these two related shags. Finally Diana exclaimed, "There's the eurasian!" The bird had flown in and joined with the American Wigeons to our left. With the morning sun at our backs, we all had excellent views of the brightly colored bird as it rested in the still water. While the group marveled at this lovely duck, a few of us continued scanning farther out into the water where we spotted one, then two RED-NECKED GREBE. Redoubling my efforts and making a few more scanning passed across the horizon, I realized that there were a total of five of these rare, large grebes present. We may have dipped on the barrow's, but so far the morning was going great. I decided to bring the group to Raptor Point to try for the barrow's in the water near Bergen Beach, then walk the runways to look for the NORTHERN SHRIKE that showed up this past December. As it turned out, the water off the point at Mill Basin was nearly devoid of waterfowl and the bay near Canarsie Pol only contained a few Common Goldeneye. Here's a good page that describes the differences between the Common and Barrow's Goldeneye. 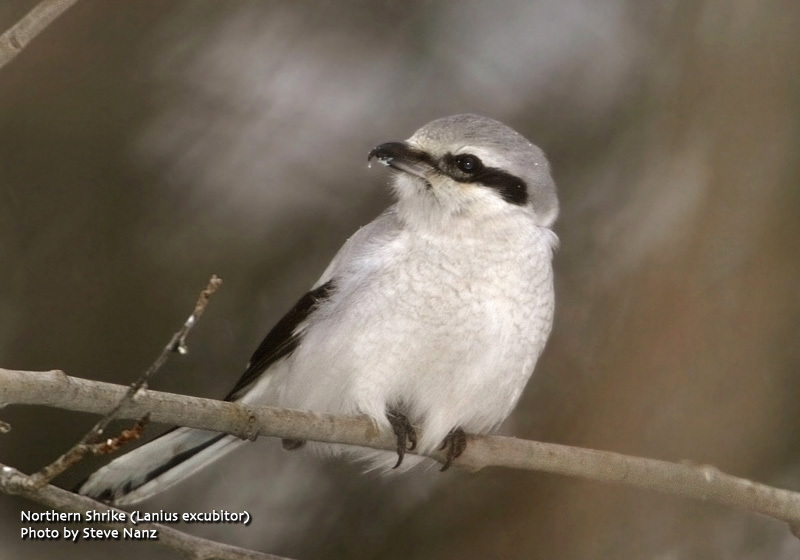 The NORTHERN SHRIKE at Floyd Bennett Field was initially discovered on December 4, 2011. It was seen by many folks up to early January then vanished, presumably to head back up to the Adirondack Mountains, where it is more typically found. It was then spotted near Field "G" again by Arie Gilbert on January 31st. I was unsuccessful on several previous attempts to relocate it, but decided to try again with the Linnaean Society group. This time I found the bird perched at the top of a birch tree near the back of Field "G". Over the course of about 20 minutes the bird dropped down to lower perches eventually disappearing into the underbrush. Thankfully, everyone in the group got good looks at this rare bird before it dropped out of view. 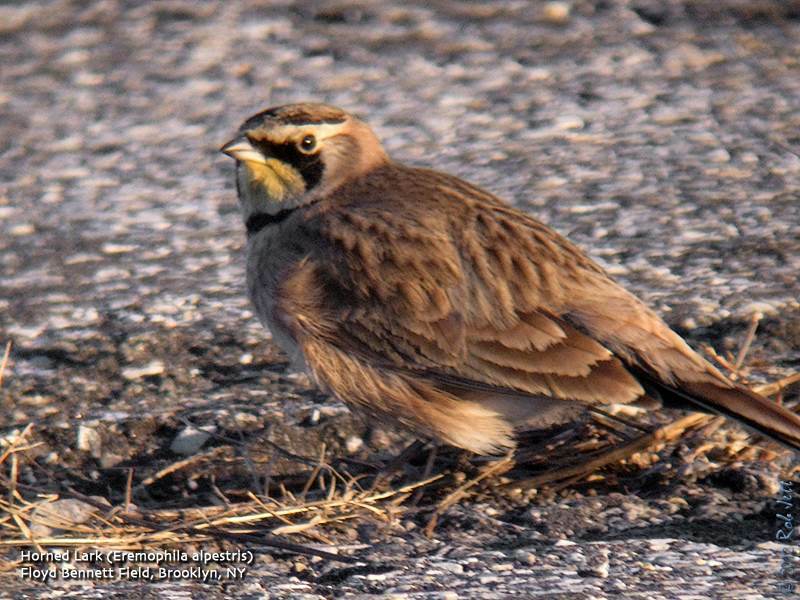 Floyd Bennett Field is one the most reliable place to find Horned Larks in Brooklyn during the winter, but for some unknown reason we had trouble locating these arctic breeders on Saturday. There are only a few spots where these birds can be found feeding - the Cricket Field, the small field in front of Aviator Sports, the patch of grass on the north side of the community gardens and along the runways. Except for the runways, I had checked these places a couple of times. After returning from Dead Horse Bay I planned on ending the trip, but asked the group if they wanted to go back to the Cricket Field for one last try for the larks. Three times was a charm. When we arrived I spotted a flock of 15 birds feeding in the grass. Then as I was counting the birds in my scope I spotted a single LAPLAND LONGSPUR! Before I could get everyone on the bird, the flock panicked and took flight. A kestrel had flown over the field. The larks and longspur circled back and forth across the grass in tight formation before coming to rest a little closer to us. Everyone got to see this particularly rusty-colored individual, which made for a great ending to an already successful field trip. 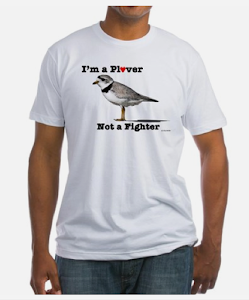 Ironically, I had just posted here last Wednesday about my disappointment with the absence of longspurs around NYC. To find either a Eurasian Wigeon, Red-Necked Grebe, Northern Shrike or Lapland Longspur while leading a birding trip in Brooklyn would be considered a very successful outing. Finding all four was, well, extraordinary. I guess the birding gods were listening. Note: None of the photos above except for the scaup at Dead Horse Bay were taken on Saturday and are for illustrative purposes only. The live webcam of a Bald Eagle nest in Decorah, Iowa returns and the hatching countdown begins. In 2011 the parents hatched 3 young. The webcam is provided by the Raptor Resource Project. NOTE: This approximately 11- mile walk is a challenging walk, not for the foot weary or timid of harsh winter elements. From the first birding location, Owl's Head Park, ending at Coney Island Pier, the casual pace will focus on water birds, gulls, and occasionally for passerines along Shore Road Park. Some birders may drop out near the Verrazano Bridge for the R train at its last stop at 95th Street and 4th Avenue, the half way point on this winter hike. Dress warmly in layers. Blizzard or dangerous ice conditions cancels. Contact the leader via text message for information regarding weather conditions, otherwise email earlier if other questions. Saturday, February 25, 2012, 9:00 a.m. to 11:00 a.m.
Meet in the parking lot at the corner of Hylan Boulevard and Buffalo Street. Participants will proceed to the tidal mud flats and other sites within the park. The focus will be on identifying wintering waterfowl in the bay and in the sheltered boat basin. We will also look for snow bunting and horned lark in open areas. Raptors can often be found later in the winter. Bring binoculars and dress for the winter weather. Saturday, February 25, 2012, 12 noon to 2:00 p.m.
Greetings. 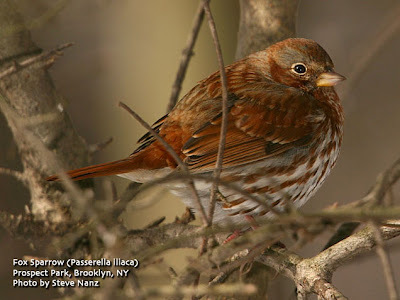 This is the New York Rare Bird Alert for Friday, February 17th 2012 at 11pm. The highlights of today's tape are RUFOUS HUMMINGBIRD, SNOWY OWL, BARROW'S GOLDENEYE, BLACK-HEADED GULL and YELLOW-BREASTED CHAT. The RUFOUS HUMMINGBIRD continues its extended visit today at the American Museum of Natural History at the entrance area to the planetarium and the RED-HEADED WOODPECKER was seen today at nearby Central Park at the northwest corner of the Hallett Sanctuary in the southeastern corner of the park. 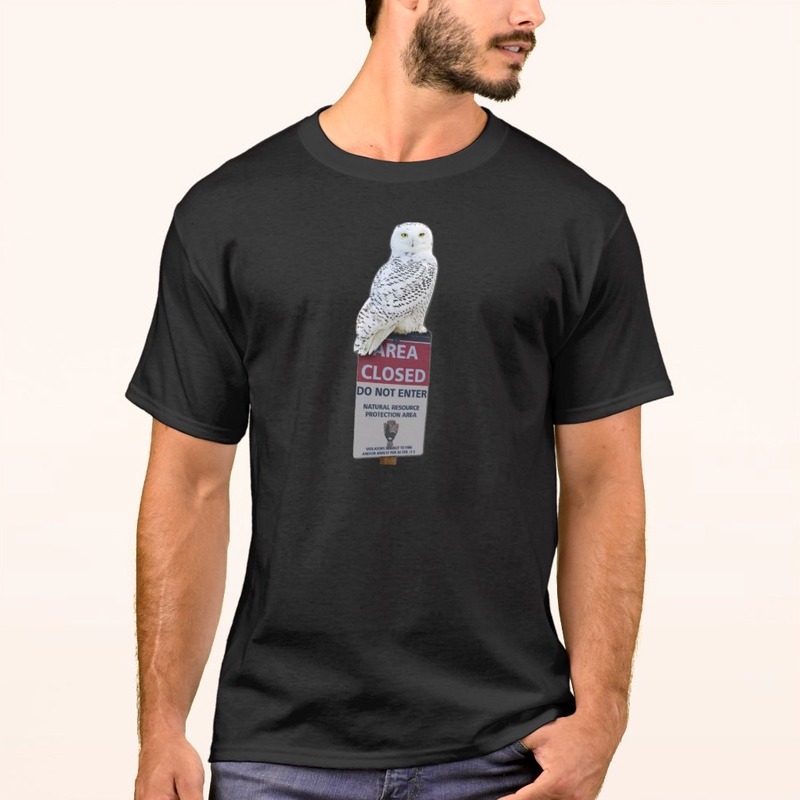 Two SNOWY OWLS were reported last week: one at Lazy Point Napeague on Saturday and the other at Breezy Point on Wednesday. The BARROW'S GOLDENEYE continues to be seen through the week at the West Pond Jamaica Bay. 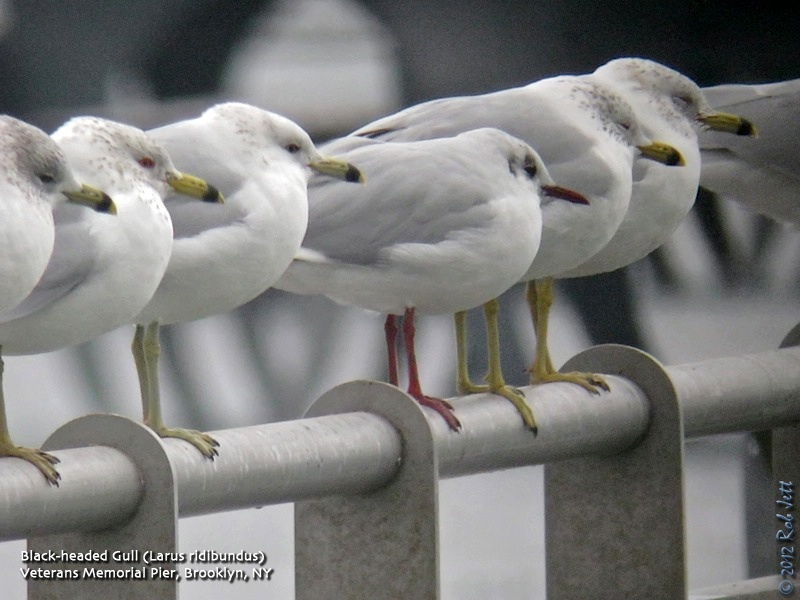 A BLACK-HEADED GULL was found last Saturday at Veteran's Memorial Pier at 69th Street and Shore Road in Bay Ridge Brooklyn. Two YELLOW-BREASTED CHATS were seen last week: one at Hempstead Lake State Park on Long Island Tuesday along Lakeside Drive north of the south pond and the other today at the southeast corner of Union Square Park Manhattan. Scattered groups of RAZORBILLS were seen. One group of 3 off Coney Island on Saturday, 2 at Pelham Bay Park on Sunday, 9 off a jetty at Shinnecock on Wednesday and another 9 at the Jones Beach Inlet on Wednesday. Also seen at the Jones Inlet were 3 HARLEQUIN DUCKS and the previously reported PIPING PLOVER and SEMIPALMATED SANDPIPER at the north end of the west jetty. 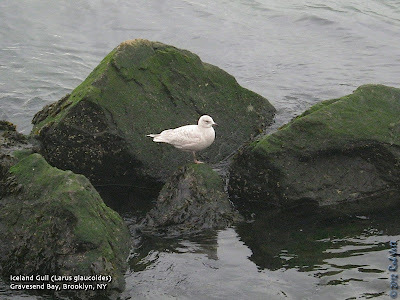 Two GLAUCOUS GULLS were seen at the Bellport Bay Yacht Club at the end of Bellport Lane in Bellport on Saturday and an ICELAND GULL was seen at the first parking lot south of the Verrazzano Bridge on Saturday, another first year ICELAND GULL was seen at the Coast Guard island at Jones Beach West End on Sunday. The winter resident LESSER BLACK-BACKED GULL was seen at Napeague on Saturday. Another LESSER BLACK-BACKED GULL was at the Jones Beach Inlet east of field 2 on Tuesday and Wednesday. Two pairs of COMMON RAVENS were seen last week presumably in the nest building activity. One pair were at the water tower at 100 Elgar Place Co-op City in The Bronx and the other pair were at the water authority property in Hampton Bays where they were seen last year. 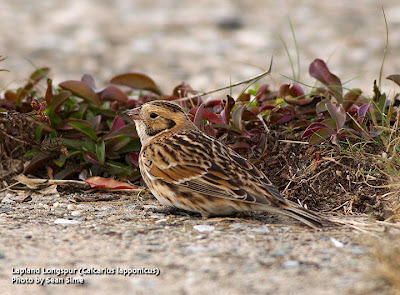 Two WILSON'S SNIPE were south of the highway at the Forge River east of Mastic on Long Island on Sunday and a ROUGH-LEGGED HAWK was seen near the Orchard Beach Bridge to City Island in The Bronx on Sunday. Tom Burke will be away this coming week. Please call in reports to Tony Lauro at (631) 734-4126. It may still be winter, but some plants have already begun to flower. This Flowering Quince is in front of the Wellhouse in Prospect Park. Other plants that I've noticed flowering this past week are Winter Aconite, hellebore and Red Maple. It has been almost 2 weeks since I've posted about my Brooklyn bird sightings. I have actually had some interesting observation, just getting the words down on the page is sometimes, for various reasons, difficult. That said, despite the mild winter affecting the appearance of some of the expected species, over the last two weekends there were some great birds around. 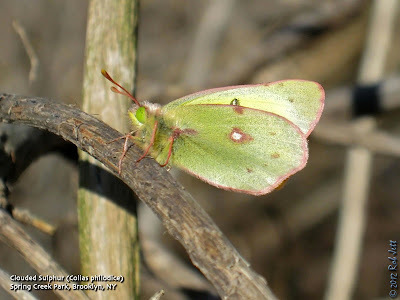 If you are a regular visitor to my blog you should know the drill...winter is a time for me to look for seasonal species around Brooklyn's coastal areas. Here is a map of the most interesting spots for loons, grebes, waterfowl, gulls and any other possible seabird that might show up. 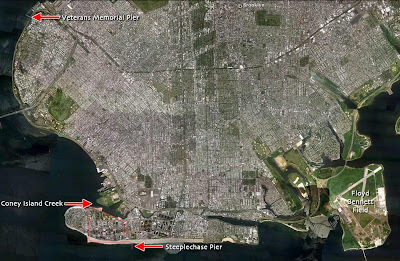 I've also outlined my usual walking route along the western end of the Coney Island Peninsula. In addition to its surrounding waters, Floyd Bennett Field is a great spot for grassland species, although I'm not sure how long that will last if the National Park Service allows the proposed natural gas lines to be built. The number of individuals in the annual Horned Lark flock has gradually increased over the past month. Heydi and I have been combing through them every chance we get, hoping to find a Lapland Longspur. Longspurs are rare around NYC, but if you'd find them anywhere, it would be hiding out among the Horned Larks. So far we haven't found any nor do I think any have been reported from the barrier beaches on Long Island. What we need is a week long cold snap to bring Brooklyn some more arctic species. We did manage to see one great species at Floyd Bennett Field. On Saturday, February 4th, Heydi and I kept crossing paths with Peter Dorosh and Mary Eyster at various points around Floyd. In the early afternoon we caught up with them near the boat ramp that looks out over Jamaica Bay. It was overcast and Peter had his scope on a distant bird that he thought might be a Eurasian Wigeon. The bird was among a fairly large flock of the more common American Wigeon and, unfortuately, they were all paddling away from us. We decided to head towards Archery Road, where overwintering wigeons usually hang out. 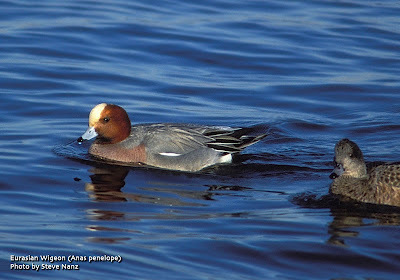 It took us a few minutes of scanning the bay, but eventually located what was indeed a Eurasian Wigeon. I wish I could say that this is a photograph of the bird, but it isn't. The wigeons were very skittish and a passing Coast Guard ship ended up flushing all the birds. 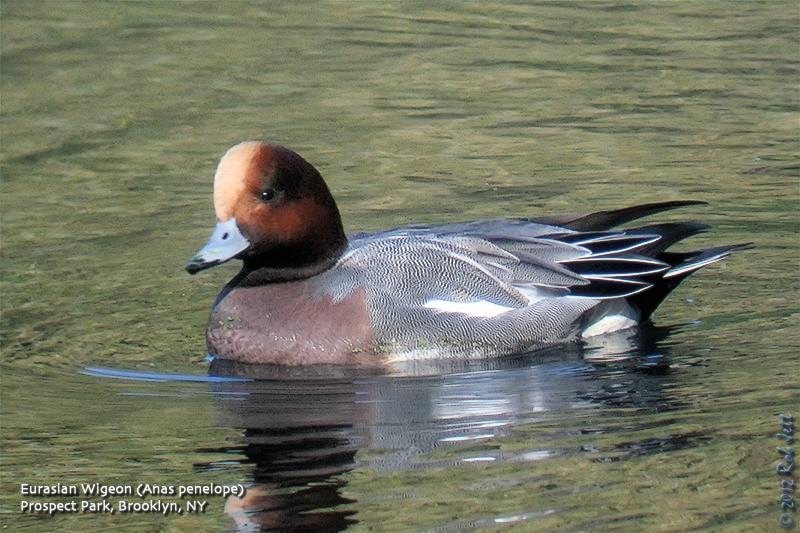 For illustrative purposes, I've used a photo of a Eurasian Wigeon that I took in Prospect Park a few years ago. They really are beautiful birds. The following Saturday I decided to search Coney Island for rare gulls. Heydi joined me and was cautiously optimistic that we'd also find her a Razorbill. I told her that it was a possibility, but didn't really believe it. These seabirds only come ashore to breed, and are normally found out on the open ocean. The one place that they can be observed fairly reliably in winter is at Montauk Point, a mere 115 miles East of where we'd be birding. I was convinced that it was a fluke that I spotted a pair there a few weeks ago. Anyway, we decided to wait for the light snow and freezing rain to subside before meeting at Stillwell Avenue. We began our day in the late morning, spending much of our time scanning birds at the edge of the jetty at West 37th Street. From an earlier observation at the fishing pier, it appeared that Herring were running. Fishermen were pulling in full lines nearly as fast as they were casting them. In the small, crescent-shaped cove on the south side of Seagate there was a tremendous number of birds feasting on the Herring windfall. Thousands of gulls, gannets, Long-tailed Ducks and mergansers were in the mix, but more notably, shortly after arriving, we spotted three Razorbills! We also spotted a single male Surf Scoter. On the jetty were 14 Purple Sandpipers. It was the most bird activity that I'd seen it in that location all winter. After watching the Iceland Gull feeding for a few minutes Shane suggested that the three of us continue north along the coast to the Veterans Memorial Pier. After such a great morning of birding, I was feeling optimistic that we would find the rare Black-headed Gull that had been showing up there sporadically. Shane had already seen this bird a few times this year, but it would be Heydi and my fourth attempt at locating it. We lucked out as the bird was right at the start of the pier, sitting within a flock of Ring-billed Gulls. I guess if you want to find this annual winter visitor to Brooklyn, you have to be very persistent or very lucky. This coming Saturday I'll be leading a trip to Floyd Bennett Field and Dead Horse Bay for the Linnaean Society of New York. The weather report sounds like it will be a fine day for looking for new birds, maybe the birding gods with send something good our way. 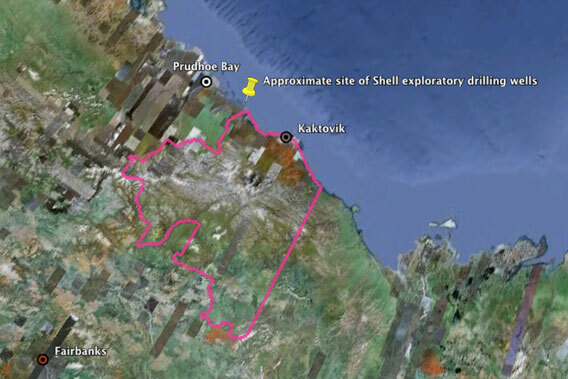 Approximate site of preliminarily approved drilling by Shell. Pink outline is the Arctic National Wildlife Refuge (ANWR). Image made with Google Earth. Drilling in the Arctic waters of the U.S. may become as contested an issue as the Keystone Pipeline XL in up-coming months. Scientists, congress members, and ordinary Americans have all come out in large numbers against the Obama Administration's leases for exploratory drilling in the Beaufort Sea and the Chuckchi Sea. Last month 573 scientists signed a letter against opening the Arctic up to drilling until more research can be done in the sensitive area. In addition, a letter signed by 60 Congress members has been sent to Interior Secretary Ken Salazar noting that the Deepwater Horizon disaster occurred only two years ago. Finally, nearly half a million Americans (400,000) signed a petition against drilling in the Arctic. Critics of the Obama Administration's leases say there is no coherent plan to clean-up a spill in the icy, remote Arctic ecosystem, which already embattled by climate change. "The Arctic is the last wild ocean on the planet. Its waters and the abundant life they support are simply too sensitive to be drilled—especially since neither the oil industry nor scientists have identified a proven way to contain or clean up a spill in the Arctic’s extreme conditions," Chuck Clusen, Alaska Project Director with the Natural Resources Defense Council, said in a press release. "At the very least, there should be no plan to lease these areas until key scientific studies have been done and until the oil and gas industry can demonstrate its ability to contain and clean up a spill." The letter from scientists asked the administration to "to follow through on its commitment to science" by following recommendations made by the United States Geological Survey (USGS) and refrain from drilling until more research can be done. Still, drilling in the Arctic could begin as early as this summer by Royal Dutch Shell. The oil company argues that it has a meticulous oil-response plan even given the intense conditions of drilling in the Arctic, including response vessels standing by. Shell Alaska Vice President Pete Slaiby told the Associated Press that the company would be ready with a capping stack, similar to what was used to stop the Gulf oil spill in 2010 after the well leaked for three months. Critics of Arctic drilling argue that given the extreme weather conditions, icy waters, and the remoteness of any oil well, it would currently be impossible to clean-up an oil spill adequately. Furthermore, clean-up efforts would almost certainly have to stop during the long Arctic winter. Currently the federal government is asking Shell to stop operations 38 days before the seasonal sea ice would arrive to make certain an oil spill doesn't occur at the end of the season. Shell is trying to overturn this ruling. "If the Obama administration were making its decision based on science rather than politics, drilling in the Arctic would be a nonstarter," Rebecca Noblin, the Alaska Director with Center for Biological Diversity (CBD). "The Arctic Ocean is America’s last best wilderness. Launching massive industrial drilling operations risks America’s Arctic legacy for oil company profits." Last year Shell had the largest oil spill in the UK in a decade, while the oil giant also accepted responsibility for two massive oil spills in Nigeria in 2008 totaling 11 million gallons of crude. A thorough report from the United Nations Environment Program (UNEP) found widespread pollution devastating Nigerian people and ecosystems. For his part, President Obama in the State of the Union address touted the fact that oil production in the U.S. was the highest its been in eight years. He also said his "directing my administration to open more than 75 percent of our potential offshore oil and gas resources." The President furthermore noted that clean energy must still be apart of the U.S. energy mix, stating "I will not cede the wind or solar or battery industry to China or Germany." Leader: Rob Jett aka "The City Birder"
Registration opens Monday 2/6. Ride: $15. Saturday, February 18, 2012, 10:00 a.m. to 2:00 p.m.
Meet in the Nevada Avenue parking lot at High Rock Park. We will follow the Red Dot Trail that loops behind the administration buildings down to the extension of Altamont Street where we will remove invasive plants and cut alien vines that strangle young trees. If you don’t have your own, Protectors will supply tools, gloves and refreshments. After a two hour work session (our 188th consecutive monthly workshop) we will take a short walk over nearby trails. Sunday, February 19, 2012, 12:00 p.m. to 3:30 p.m.
We'll take an easy walk on the white trail to Rockland Avenue and the nature center. Learn why this is a wet woods! Please wear waterproof shoes. Meet at the parking lot by the archery range, accessed by car via Eton Place off Richmond Avenue. Look for the sign for the carousel. For more information, contact Hillel Lofaso at (781) 751-6629. Floyd Bennett Field Under Threat!